SKECHERS USA, Inc., a global innovator of performance footwear, today announced that the new zero-drop Skechers GObionic ultra-minimal running line has been named “Editor’s Pick” in the October 2012 issue of Runner’s World UK. Skechers GObionic was launched in August after development by the Skechers Performance Division through a unique engineering process – where nature and inspired organic design drive innovations. At the foundation are 18 decoupled bio-responsive Resalyte(TM) cushioning zones added to key flex points of the foot to offer protection without compromising responsiveness. Plus with zero heel drop, the foot remains in a neutral position for more of a barefoot experience. 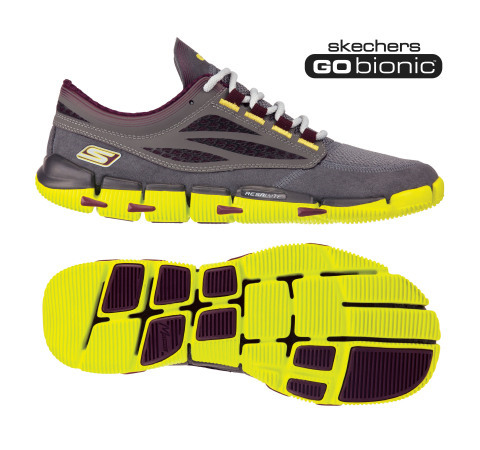 Skechers GObionic represents the Company’s most minimalistic design without sacrificing performance. In addition to Skechers GObionic, the Company recently introduced Skechers GOrun ride, which offers enhanced cushioning for elevated comfort and support; Skechers GOwalk, a comfortable walking shoe constructed with performance materials; plus Skechers GOtrain, a workout shoe built for added stability and control. From the track to the gym, with additional categories launching soon for the trail and golf course, the Skechers GO platform will meet the needs of athletes at every level and ability across multiple sports and activities. Men’s and women’s styles from the entire Skechers Performance footwear collection are available in sporting goods, department and specialty athletic stores around the world.